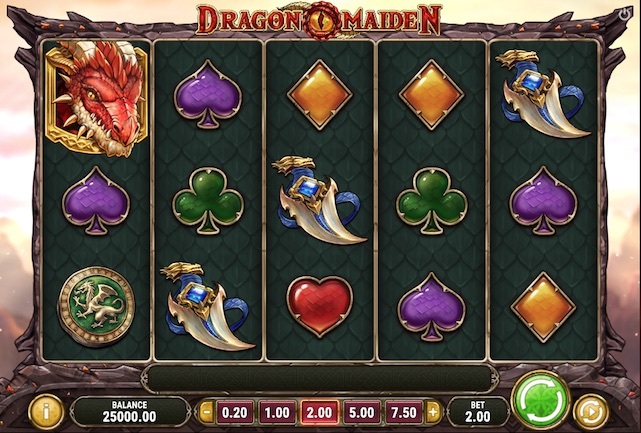 Dragon Maiden is a 5 reel fantasy slot from Swedish games developer Play’N Go. If there’s a reason to play this slots game, it’s the staggering amount of ways to win. Ranging from 243 to 7,776 ways to win, Dragon Maiden’s high variance engine sees Geneth on her journey to slay the Red Dragon. But I don’t really care about that, it’s the 3 high wilds, reels that go to 6 high and the golden free spins that I’m interested in. In this Dragon Maiden Slot review, I’ll tell you what it’s all about. We’ll look at how much you can win? How you win, how much it is to play and we’ll analyse the slots features. From the moment you begin to play the Dragon Maiden Slot, it’s easy to see the level of work from Play’N Go. 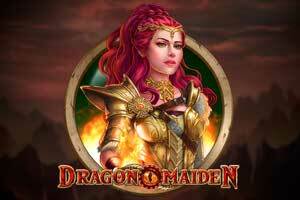 With high-quality graphics, thunderous sound and clever game features, Dragon Maiden is a real money gaming gem that sits somewhere between Game of Thrones and Lord of the Rings. Playable from £0.20 to £100 a spin, Dragon Maiden is a betting adventure for everyone. Designed using the latest software, the new online slot is mobile responsive and incredibly well put together. It has a payout rate in the high 95% RTP region and a jackpot of 12.5x your betting stake. The highest possible win per spin is an immense 5,000 x your betting stake. Game features include expanding wilds, re-spins and free spins with expanding reels. And it’s those expanding reels that make all the difference. One of the main reasons we play slots is win lines, online slots far surpass fruit machines for their sheer number of win lines. When winning on a number of paylines in a single game round, all winnings are added together. That’s why you play the Dragon Maiden Slot, 7,776 ways to win money. How much can you win playing Dragon Maiden? Want to know if new online slots are worth playing, look at how much you can win playing! What’s great about Play’N Go Dragon Maiden is the number of ways to win, but let’s look at some of the single wins that get added together. As usual, I’ll be doing the whole lowest bet and biggest bet explanation. That’s £0.20 and £100 a spin respectively. The slots paytable is made up various fantasy elements such as jewels and medieval card symbols. There’s the beautiful Geneth, weapons, a shield and our fire-breathing badass dragon. Some of the single wins if playing for £0.20 include £0.02 (lowest win for 3 x clubs or diamonds). 5 x clubs return the £0.20 bet, 5 x daggers pays £1.00 while the slots jackpot is £2.50 if playing at £0.20 a spin. The single spin max win of 5,000 betting stake is £1,000 at this level. You can win £10.00 as the slots lowest win (3 x clubs or diamonds). 4 x heart symbols pay £50.00 and 5 x dragon symbols pay £250.00. Mid-table wins include £750.00 for 5 x ring symbols and £1,000 from 5 x red jewels. High rollers win £1,250 as the Dragon Maiden jackpot whereas the 5,000 x betting stake max win is a whopping £500,000. Dragon Maiden is a graphically brilliant and stunning looking slot from Play’n Go, but what about game features. 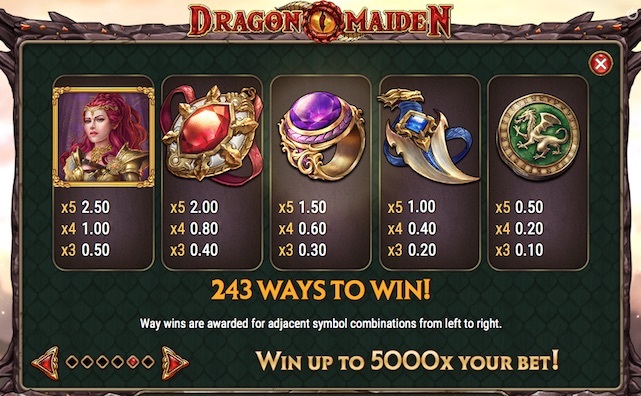 In our ultimate guide to online slots features, we look at ways in which some slots can transform during gameplay to improve gameplay, the Dragon Maiden slot is one of those games. While trying not to over complicate things, Play’n Go use a base game 243 ways to win engine with expanding Wilds. 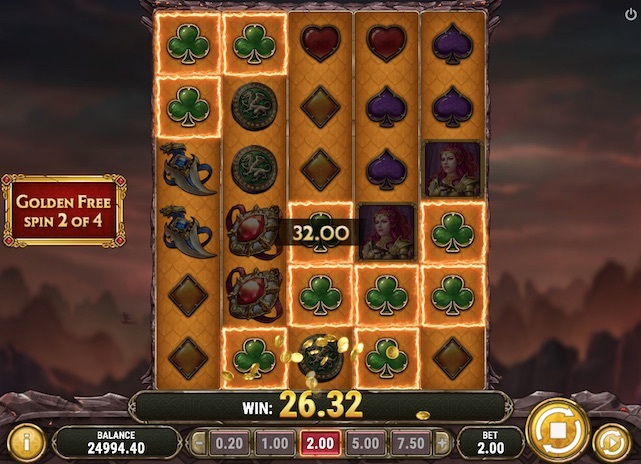 The Dragon concept works with inventive ‘unleash the fire’ re-spins (Dragon Scatters) while a 2 level free spins driver can increase ways to win by 32 x from 243 to 1,776. Geneth the Dragon Maiden turns Wild and that’s the first feature of this game worth mentioning. I’ve mentioned Wilds in other new slots reviews but this is quite special. Not only does Geneth substitute for other symbols to help produce wins, but she can also expand up to 3 symbols high. There’s a nice touch to this extra and that’s the look, feel and sound of fire! Probably one of the better Scatter symbols out there, the Dragon Maiden Scatter packs a good payout punch. There’s also some nice animation that comes with any fire-breathing overgrown lizard, Play’n Go do this stuff well. Dragon Scatters bring incredible value to Dragon Maiden in a number of ways. No argument here, you’ll want them in your game. Dragon Scatters award re-spins, free spins and also increase the reel height when they breath fire in the bonus feature. 2 or more Dragons trigger a re-spin with Dragon Scatters remaining in position for that re-spin. The result is high potential win value. The main selling point here as that more Dragon Scatters can keep re-triggering re-spins, that’s the magic in play. But wait for it, 3 or more Dragons and you’ll trigger the free spins game. What’s better than free spins? it’s no trick question, what about golden spins? even better, both! I’ve taken on several new online slots reviews recently and few free spins games stick like this. I find it hard to strip down a multi-level free spins game, but that’s exactly what Play’n Go Dragon Maiden offers; two levels. And trust me, level two is good, but there’s a caveat. It’s called high variance gameplay. As I said earlier, 3 Dragon Scatters trigger the free spins game that can offer 8, 10 or 12 initial freebies. What makes these freebies so different from other slot games is how the Dragon Scatter gets involved. Dragons on reels in this bonus will expand the reels they fall upon, and this expansion can climb to six high, generating a huge increase in payout power. Once a reel reaches 6 high you are awarded a Golden Free Spin. 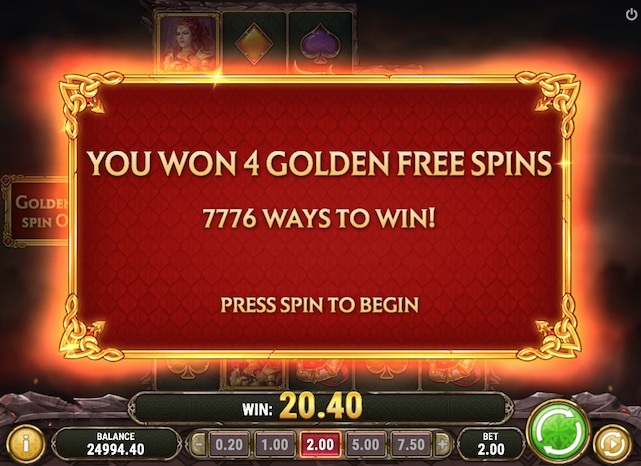 Golden Free Spins kick in on completion of normal free spins but work on a game engine of 7,776 ways to win. 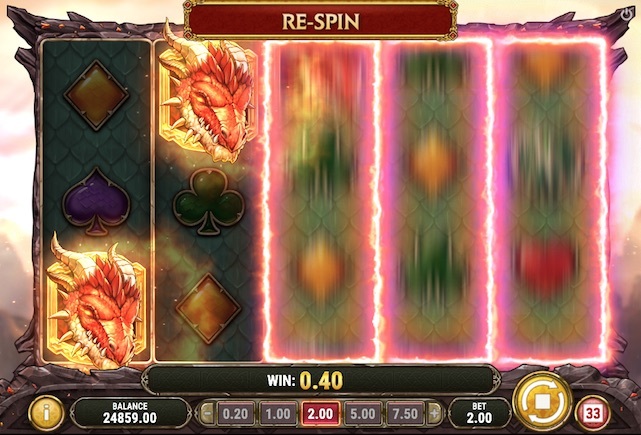 Just look at the screenshot above (Dragon Maiden slot in Golden Spins Mode) and you’ll see a fully expanded reel set, this is the best of what the game can deliver. But it is high-variance, and that could mean lots of betting to see it. Is it worth it? Probably. 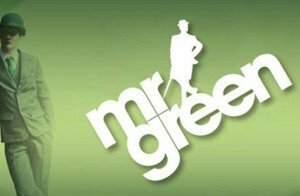 When playing at £2.00 a spin, the free spins game returned a win of £52.00, a win 26 x the betting stake! As the next online slot following Gunslinger: Reloaded, Play’n Go trade multiple choice for multiple level. Dragon Maiden enters the fantasy dragon-themed slots genre with more fire than we’ve seen before. The 20p betting price tag will suit most while the base game expanding wild adds potential payout power to every spin. But forget those things for a moment. This slot is a high variance battle to the finish, either your money’s gone or you make it to one of the most valuable Golden Free Spin Games you’ve ever bet against! Unleash the fury of the dragon if you dare.